Overlooking the fairway of The Creek Club golf course’s ninth hole, these model homes exhibit a completely fresh design perspective, with the interior and exterior reflecting contemporary living at Reynolds Lake Oconee, which is home to one of the most elite collections of golf courses and amenities in the United States. 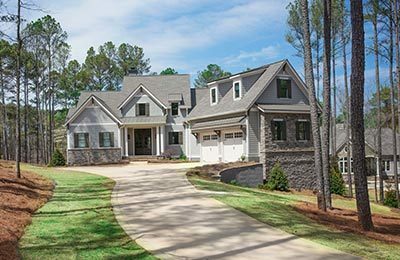 For a single-day model home pass and turn-by-turn directions, stop by any Reynolds Lake Oconee gatehouse. For additional information or to discuss fitting these homes or other homes from our Signature Home Collection onto a homesite that is perfect for you, please call 800-800-5250. 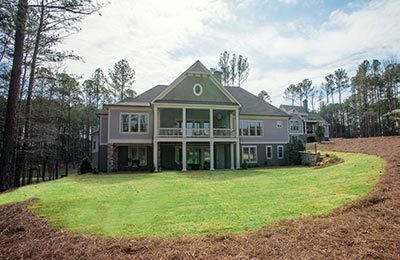 Designed to take full advantage of the panoramic view overlooking the ninth fairway of The Creek Club, this home offers a refreshing farmhouse style with clean lines, a mixture of shake and lap siding, and well-placed accents of stone veneer and metal roofing. A bracket-supported overhang completes the thoughtfully crafted detail on the exterior of this home. Suited for entertaining both inside and out, the main living space boasts 20-foot ceilings with ample natural light, easy access to the covered porch and a well-appointed grill deck resting right off the kitchen. Take the stairs or elevator down where even the littlest of guests will enjoy their own bunkroom. A game room and two additional guest suites have easy access to walk out onto the lawn patio — ideal for family members and guests alike to relax into the evening. Camden Homes partnered with Alicia Mooney-Macchia of Alicia Mooney Interiors to bring the blueprints to life. Proudly overlooking The Creek Club’s ninth fairway, this home reflects an elegant mixture of stone and cedar shake accents, balancing charm with style. Metal roofing and a cedar pergola frame the arched carriage-style doors of the three-car garage, bringing continuity to the overall design. Inside, entertain friends and family comfortably in the oversized kitchen, or head outside to the rear porch and gather around the outdoor fireplace. Serve your guests from the downstairs wet bar, where plenty of entertaining space awaits outdoors underneath the covered patio. At the end of a day of entertaining or practicing on your personal putting green, the master suite beckons you to relax with a coffered ceiling coupled with a large closet and spacious bathroom, creating a special retreat. A second bedroom on the main floor can serve as an office or guest room. DreamBuilt LLC partnered with Shane Meder and Black Sheep Interiors to make this house a home. Ready to find your own path home? Fill out the brief form below and a member of our team will reach out to show you how easy it is to find your way home to Reynolds Lake Oconee.